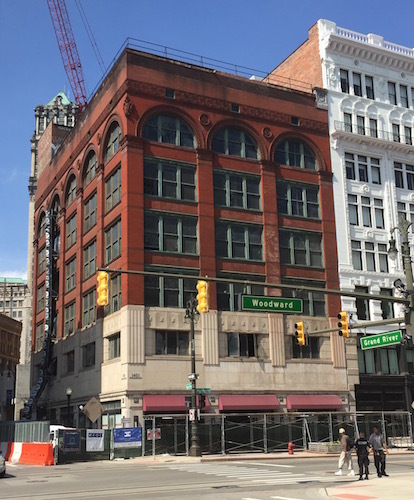 The Elliott Building along Woodward Avenue in downtown Detroit has secured financing for a $12 million renovation into 23 loft-style apartments along with ground floor and lower level retail space. The project is scheduled to be completed in spring 2017. Located at the northwest corner of Woodward and West Grand River Avenue (1401 Woodward), the building will offer four, two-bedroom apartments on the upper floors, and 15, one-bedroom units. The first floor offers 4,000 square feet of retail space, while the lower level is 5,000 square feet. The seven-story, red brick and limestone structure was built in 1895. It was the first location for the S.S. Kresge five-and-dime chain of stores that became one of the nation’s largest retailers in the first half of the last century. The renovation team includes Kraemer Design Group in downtown Detroit and O’Brien Construction in Troy. The lenders are Capital Impact Partners, InSite Capital, Invest Detroit, and the Michigan Historic Preservation Network. Higgins also owns the Broderick Tower at Woodward and Witherell in downtown Detroit, and the Leland House at Bagley Street and Cass Avenue.